My husband and I have a running thing (not really a joke per se but it is one of those things that gets said over and over) it goes something like this… we will be listening to some couple tell their engagement story complete with horses or some other grand detail or we’ll watch the viral video of the guy who does the flashmob proposal where he has his soon to be fiancee sit in the open back of a car and all their known friends and relatives sing and dance and act out the Bruno Mars song, I think I Want to Marry You. In the couple scenario, after the telling of their story we usually get asked to tell our engagement story. (Turn about is fair play after all). “Well”, we say, “we don’t really have one”. Then we proceed to tell the whirlwind story of how we met in late March of 1986 and were engaged by the end of July. Honestly I am not even sure what the actual date of our engagement is except that we told my mom we were getting married on July 4th, 1986 before we had even bought the ring. Kent knew pretty much right away he wanted to marry me and began bringing up the possibility in conversation just a few weeks after we met. I took a little convincing, as I was 16 and had previously planned it all out and intended to get married in my mid twenties after finishing college. Aside: Life is funny that way. you think you have a plan and then…as the mom said on the Six Feet Under episode we watched last night, it rarely happens the way you think it will. My plan, up until this point, certainly did not include meeting the one great love of my life at a conference at the Anaheim Marriott. So we go on and tell them our story, how he moved down to where I lived, how one day I got so freaked out by it all I lied and said I didn’t love him, how he knew and refused to believe it. We tell them how we talked about it many many times and how at some point I just realized that, YES. I did want to marry him. Usually it is sometime around here (or in the video scenario when it ends and we are both teary eyed) that Kent says, one of these days when you least expect it, I am going to propose to you. Here’s the thing he has been proposing to me all along. Every time we spoke about it he was proposing that we were better together than we were apart. There was no horse, or song and dance number, but there was proposing. I have come to a realization recently and I would like to share it with you. A proposal of marriage is NOT a one time event. The dictionary defines a proposal as an offer of marriage and one definition I found of marriage was “any intimate association or union”. Back in the day Kent did propose to me and I have come to see that from that point on we have been proposing to each other ever since. Many years ago before we had children, Kent and I had a big shift in the way were looking at and experiencing life. On one particular night I remember him saying, maybe I should just let you find someone else, you could do so much better than me. I said no and told him I didn’t want someone else I wanted him: I proposed we were an us. We were. We said yes. Proposals don’t always come on white horses or on beaches at sunset. Sometimes proposals come in the middle of tornados, sometimes they come on really hard days. The important thing is to say yes when they come, and to propose again tomorrow. 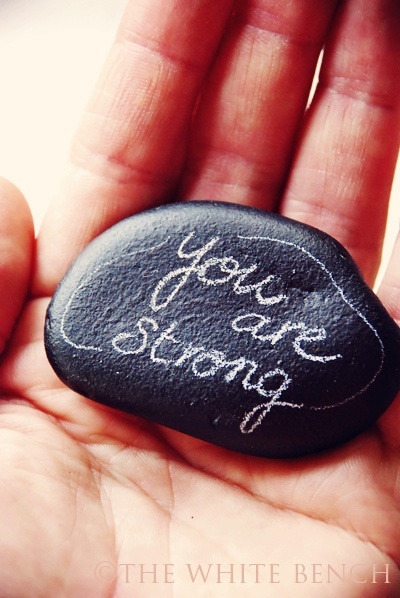 You Are Strong. That is the message Kent wrote to me on my side of the bathroom mirror the day before yesterday. Those three words. Changed my life. In that moment he offered me afresh to join him in an intimate union. Sometimes proposals are simple and take 5 seconds to scribble on a mirror. Aside #2: A couple months ago I grabbed a dry erase marker normally used for my family fridge calendar and wrote something I appreciated about Kent on his side of the mirror. He left it there. I liked doing it so I kept changing it each day. A couple days into my little proposals I had one on my side of the mirror. It is one of the most beautiful things we have ever done. And now I realize, each one a proposal and offer of intimate union. On our 25th anniversary we celebrated by renewing our vows, I wrote mine out and Kent spoke from his heart. These vows were also a proposal; an offer of intimate union. Some times proposals are made on the glorious days when babies are born or marathon finish lines are crossed. Sometimes they are grand, romantic and/or breathtaking. It happens every day now that I have eyes to see it. I propose to him when I ask about his hard day. He proposes to me when he helps me clean up after dinner. I offer intimate union when I make a family meal for us all to share. He offers it to me when he asks what show I prefer to watch on the DVR. We propose to each other when we forgive the other’s faults and shortcomings and when we celebrate each other’s accomplishments and victories. Don’t get me wrong, I am a sucker for a good proposal story. And, if I’m beng honest, I am looking forward to being surprised one day when Kent throws down with his “big proposal”. But you know what? This is our new proposal story and it will keep getting longer, more breathtaking and more complex with each offer made to one other. Every addition to this story is beautiful. Every one spectacular when you think about it. Michelle, have you ever seen Keeping The Faith (Ben Stiller, Jenna Elfman, Edward Norton)? In addition to being a romantic comedy with three gorgeous people, it has a few things to say about Faith (as opposed to religion), maybe not earth-shattering revelations, but interesting and funny and (to my way of thinking anyway) true. In a scene towards the end, Ed Norton’s mentor, a priest (Milos Forman) says that, whether taking the vow to be a priest or choosing to be with someone, it’s not a one-time thing, but a choice you make over and over again.